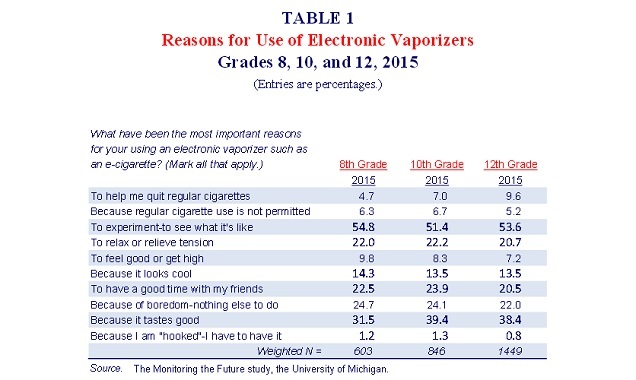 For those intent on claiming that e-cigs are a gateway to conventional cigarettes, the new Monitoring the Future study has a pretty devastating result: it turns out most teen vapers don’t even use nicotine. The gateway hypothesis hinges on the idea that e-cigarettes are “creating a new generation of nicotine addicts,” and those addicts may therefore go on to smoking, but the latest finding is another in a long line of results which suggest that the reality doesn’t match up to the theory. The results are being partially withheld and spun as if they’re still bad for e-cigarettes – the press release is entitled “most youth use e-cigarettes for novelty, flavors, not to quit smoking” – but the real interpretation is clear. Most of these teen “vapers” we’ve been hearing about for years probably aren’t regular users at all, and it seems like they aren’t even risking developing a nicotine addiction. But we’re still supposed to be worried, right? More teens had vaped in the past month than had smoked: between 9.5 and 16.2 percent, increasing from 8th to 12th graders, compared to 3.6 to 11.4 percent for smoking. Vaping has decreased slightly from last year, and smoking has reached a new all-time low. Over 60 % of teen vapers don’t use nicotine – or at least they didn’t the last time they vaped. These findings present a big problem for the gateway hypothesis – because most probably don’t get addicted – and when more data is released it will probably get worse. The new Monitoring the Future survey follows the same basic approach as the older ones: ask a bunch of 8th, 10th and 12th graders about their use of various drugs, alcohol, cigarettes and (since last year) e-cigarettes. The survey has been running since 1975, and the 2015 one covers about 45,000 high school students, from 382 schools, with the sample chosen to be representative of the US. The 2014 survey found that more students had vaped in the past 30 days than had smoked, and this year the same is true again. The number of teens vaping in the past month has generally declined since 2014, rising 0.5 percent in 8th graders, but decreasing by 2.2 percent in 10th graders and 0.9 percent in 12th graders. Last year, smoking was at an all-time low, and the same is true again this year, with it decreasing in all grades (whether you look at ever-smoking, past-month, daily or half a pack or more per day). Of course, they attribute this to the standard battery of anti-smoking policies, not even mentioning vaping. Why Do Teens Try Vaping? One of the only other pieces of information they’ve released about the study so far are the students’ reasons for using e-cigarettes. According to their press release, the reasons show that the flavors are attracting youth, and that the teens largely aren’t using e-cigarettes to quit smoking. The most common reasons given were experimentation (i.e. “seeing what it’s like”), because it tastes good, boredom, to have a good time with friends and to relieve tension. The number using them to quit was generally a lot lower than you might expect, ranging from 4.7 percent in 8th graders to 9.6 percent in 12th graders. This combination of factors was taken as an indication that teens aren’t vaping to quit smoking, they’re just “lured in” by the flavors. However, one key point is that over 60 percent don’t use nicotine e-juice (or at least didn’t the last time they vaped), and only about 22 percent knowingly vape nicotine liquids. Is Teen Vaping Really a Big Issue? Surveys like this are often used to drum up concern about youth vaping, but it's not as simple as it seems. The big problem with how they define “use” in this survey is that vaping in the past 30 days does not mean you’re a regular vaper, and studies in both adults and youth have shown that most people who’ve vaped in the past month really aren’t regular users. With this in mind, the results from this study seem to paint a pretty clear picture. The focus on “use in the past 30 days” has led to most of the teen vapers it identified being experimenters, with the genuine smokers using them to try to quit being a smaller sub-group, who probably use them more regularly. Since most of the group is just experimenting, they aren’t really in it for the nicotine: they just want to give vaping a try without the whole addiction aspect. In addition, every single study that has looked at the whole non-smokers vaping issue – including last year’s Monitoring the Future – has found that only a small percentage (around 4 to 7 percent in last year’s Monitoring the Future and much less elsewhere) have vaped in the past month, and much fewer do so regularly. It seems that there is a lot more concern about non-smoking teens vaping than is justified by the evidence. So what does this mean for the gateway hypothesis? The basic idea is that the delicious flavors are going to lure teens who wouldn’t have otherwise smoked into vaping, then they’ll get addicted to nicotine and think, “screw all this less harmful, lovely-tasting vapor, I want some harsh, acrid, carcinogenic smoke in my lungs!” presumably to get a better hit of nicotine. Lured in by flavors? Possibly, sort of. This study shows that flavors are a big factor, but it also that general experimentation is a bigger one. Other evidence, however, suggests that non-smoking teens are much less interested in flavors than smoking adults. Get addicted? Frankly, no. It seems like most teens aren’t even at risk of becoming addicted. Not only is the number of never-smokers trying vaping small, no-nicotine vaping seems much more common in youth than nicotine vaping, and most teens don’t offer addiction-like reasons for vaping. This all might explain why regular vaping in never-smokers is extremely low: it’s just for the clouds and flavor. Progress to smoking? While possible, it doesn’t look that way. Overall, the rise in vaping in teens (and adults) has been accompanied by even less smoking. Smoking rates could still be declining if there was a gateway effect – the number quitting smoking would just have to be bigger than the amount progressing to it from vaping – but it’s still a positive sign. The second point in particular is crushed by this study (and all of the evidence we have so far), and that causes a big problem with the motive behind the supposed switching from vaping to smoking. Would someone not addicted to nicotine bother to switch to something they know is way worse for you, just to get some? It seems pretty damn unlikely. It would be like someone who chooses alcohol-free beer and non-alcoholic cocktails suddenly switching to drinking hand sanitizer to get drunk. Science by Press Release to the Rescue! So how do we go about maintaining disapproval of vaping? Present plenty of information about smoking (and other drug use), but keep the vaping-related information thin on the ground. Last year, they reported the number of never-smokers who’d vaped, but that data hasn’t been released yet – did they remove that question this year while they were adding new ones? Or did they just think that presenting the intended conclusion before the rest of the data would help to advance their message? How many of the never-smokers used no-nicotine liquids, I wonder? By the time we find out, the story will seem like old news. It would be even more informative if they also asked about daily use, but I’m not holding my breath on that one. So it's a very good marketing strategy to attract young people, to make them comfortable with these devices, then the next step of using it with a drug is much easier. Yeah, that’s what’s happening. Companies are specifically marketing nicotine-free e-cigarettes to youth with the ultimate aim of getting them addicted to nicotine. It makes perfect sense! The lack of evidence for this statement scarcely needs pointing out: she’s basically just making up any explanation to avoid the troubling business of admitting that the gateway hypothesis just seems to be completely wrong. It’s hard to imagine that a more complete breakdown of the data would do anything but strengthen what this clearly shows: vaping is not proving to be a gateway to smoking, at all; it might not even lead to nicotine addiction in most teens. Any reader capable of staring the available facts from this study directly in the face would come to one simple conclusion: the gateway hypothesis is increasingly unlikely to be true. If most teens aren’t even vaping nicotine liquids, and if the full results show – yet again – that only small numbers of non-smokers even try vaping, no matter how much you try to spin it, the gateway hypothesis is clearly not supported by the evidence. Here’s a wild idea: maybe people should stop pretending it is.